A new anti-inflammatory drug moving into phase two clinical trials to treat two serious diseases was built on a scientific collaboration with a UO chemist. 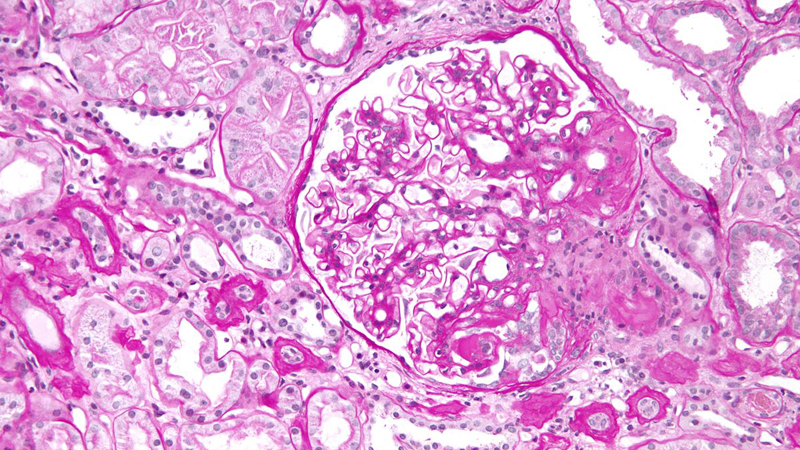 The new drug, CXA-10, potentially offers a nonsteroid alternative for addressing two diseases marked by inflammation and scarring: focal segmental glomerulosclerosis, commonly known as FSGS, and pulmonary arterial hypertension. Bruce Branchaud, professor emeritus in the Department of Chemistry and Biochemistry, was on a six-person team that, beginning in 2004, sought to figure out how a set of previously known biological molecules, known as endogenous nitrated fatty acids, worked. The team, led by Bruce Freeman, then of the University of Alabama, Birmingham, and now at the University of Pittsburgh, determined that the compounds are important cell-signaling agents that perform much like hormones. CXA-10 is the lead drug for Complexa Inc., an international biopharmaceutical company co-founded by Freeman in 2008. The company has offices in Pittsburgh and Radnor, Pennsylvania. Branchaud is a shareholder and a science advisory board member of Complexa. The CXA-10 molecule and related compounds are covered by patents co-owned by the UO, with Branchaud as the inventor, and the University of Alabama, Birmingham; Cardiff University in the United Kingdom; and Morehouse School of Medicine in Atlanta. The patents are licensed to Complexa. Early next year, with an infusion of $62 million in venture funding announced in July, Complexa will test the drug’s effectiveness and safety in phase two clinical trials for the two diseases. Current treatment for FSGS relies on vasodilators to improve drug flow and steroids to reduce inflammation. The hope is that CXA-10 could replace the steroids. For pulmonary arterial hypertension CXA-10 could be used along with vasodilators. The research on the molecules with Freeman’s group began shortly before Branchaud took a six-year leave of absence, beginning in 2005, from the UO to serve in scientific leadership roles at Invitrogen and Life Technologies. Branchaud also is a consultant and shareholder for Revelar in Lake Oswego and co-owner of Gen10 Bioscience, a biotech start-up in San Diego. Branchaud was also a co-founder and co-owner of SupraSensor, a start-up company based on UO intellectual property from the Michael Haley and Darren Johnson chemistry groups. The Climate Corp. acquired SupraSensor last year.